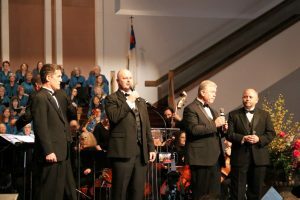 MOORE—On Tuesday morning, Jan. 15 at Moore, First, the Singing Churchmen (SCM) of Oklahoma, Singing ChurchWomen (SCW) of Oklahoma and Oklahoma Baptist Symphony (OBS) performed at the prayer service for Oklahoma’s newly inaugurated Governor Kevin Stitt. 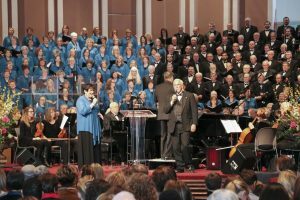 Among the three music groups, there were an estimated 450 people performing popular songs the groups have sang in the past like “Lion and the Lamb,” “The Majesty and Glory of Your Name,” “I Will Not Be Shaken” and more. The SCM is comprised of ministers of music, key worship leaders, pastors and staff members from churches across the state of Oklahoma. The men come from all different backgroundS and expressions of worship. Some are ranchers, business owners, concert artists, but all seek to stand should to shoulder as they join their voices together to share the Gospel. The SCW is a volunteer group of professional and non-professional musicians. They number more than 300 and come from Baptist churches across Oklahoma. They can be found serving in their churches, communities or any number of places of service. Every member of SCW is involved in worship and music ministry in their church and desire to be godly examples to all they meet and to exhibit the love and grace of Jesus in their lives. The OBS members allow God to use their music as a ministry of worship and witness to those who hear them. They are sponsored by the Worship and Music ministry of the BGCO and are made up of more than 80 members, each desiring to praise God with the instrumental and musical skills God has given them. Other musical performances at the prayer service included worship leaders Lauren Phelps and Kelsey Luetjen from Woodlake Church and the Cherokee Youth Choir. For a schedule of upcoming SCM, SCW and OBS performances, visit www.bgco.org/worship.